How ya doing today? How is your week going so far? I hope good, but if you are like most of us, there are times of trial and worry and work and fret. Things that are tough to deal with. Things that are tough to understand. Things we don’t want to deal with. What are we to do? How are we to deal? If we are looking down the barrel of a tough week, a trying time, a moment of fear and worry and stress, what are we to do? We are told to count our trials as a joy. That’s nearly impossible to do, to me. I don’t like my trials. I don’t like dealing with them. I wish they would go away. I wish they weren’t a reality in my life. So, why should these trials be counted as joy? Why should I value them? Why should they be seen as good things? Because they make us turn to Jesus. They make us turn closer to God. They make us reply on His strength, not ours. On His power, not ours. On Him. Not us. Today, no matter what you are facing, allow it to turn you to God, not away from God. Allow it to draw you closer to Him, to His mercy, to His grace, to His power. Allow it to be something that will bind you closer to God. And then, it’s a blessing. 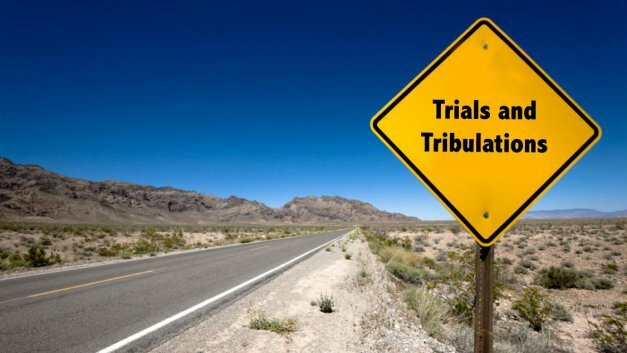 Today, count these trials as a joy. They can, if we allow, draw us closer to God. May everything in our lives today be a chance for us to get closer to God!